Description: Free program that will aid with star tests and various other optical tests. This is a nice little free program offered online for those of you out there who feel that star testing is an important part of Astronomy. I must say that personally I am not into doing star test after star test but it is a nice skill to have if you ever get a new telescope. A quick and simple star test if performed correctly can offer up a whole host of information regarding the optical quality and limits of your scope. I must mention that this program is by no means geared towards beginners but in the same light I must mention that it is extremely simple to use. It will not teach you very much about what a star test actually is but it will help those with even a limited amount of knowledge. I am by no means an expert star tester yet this program has allowed me to fairly accurately (at least I think so) pinpoint a few small faults in my telescopes optics. A quick search of all of the major online download archives will quickly bring you right to the file that you want. I recommend CNet or ZDNet for most of my downloads. There is also a web page listed in the about section of the program. It is http://aberrator.astronomy.net - I have never been to this page but I assume that they have a version of it there. Also the program does not come with a tutorial and once again I assume that if one exists it will be on the web site. The program itself is rather crudely put together yet it still has some strange appeal to it. It looks complex but the opposite is quite true. There are a few small glitches and most are simply typos and words that for some reason do not show up completely. Other than the shareware/freeware feel the program is an excellent tool for the star tester. The first step of the program is to set the diameter of the telescope and the central obstruction percentage for your scope. After that you can simply adjust the different optical flaws which are most common in telescopes. These include coma, astigmatism, spherical aberrations, pinched optics, tube currents, and a turned down edge. There is also a control for focus and a zoom for easier inspection of the results. After setting the aberration you simply hit calculate and boom you are given a simulated star test. This is just the start of it. The program also allows you to compare intra-focal and extra-focal examples side by side. Other than this you can check planetary views either with or without any aberrations. More features include double star tests, chromatic aberration tests, and wavefront error tests. The problem is that a few of these last tests get quite complicated and may be beyond the average observer. Perhaps the best feature is the planetary tests. If anything this allows you to see what your telescope may really be capable of on the planets. All in all Aberrator is a very useful program that all amateurs should consider downloading. It is complicated but some of the more basic features are usable by a much wider range of people. Hopefully they release a few new versions and polish it up just a bit in the future. A good tutorial or help guide would be immensely useful. Other than that I really can’t complain, it is free. Looks like there will be a new version out soon. The web address has been changed to http://aberrator.astronomy.net. It is a much cleaner site with a few previews of what the new release will offer. 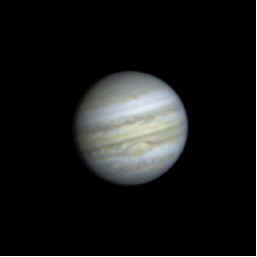 It will even show the effects of chromatic aberration on the planets and stars.